This week I'm happy to be sharing a few projects and posts inspired by my recent rediscovery of Little House on the Prairie. I've been reading the books, and watching the television show, and getting others in the family to join my addition. Back in the days of Laura Ingalls, traveling in the winter meant loading heated stones into the wagon to keep feel warm. Thankfully that's no longer needed, but keeping hands warm, even with car heaters, can be a challenge. 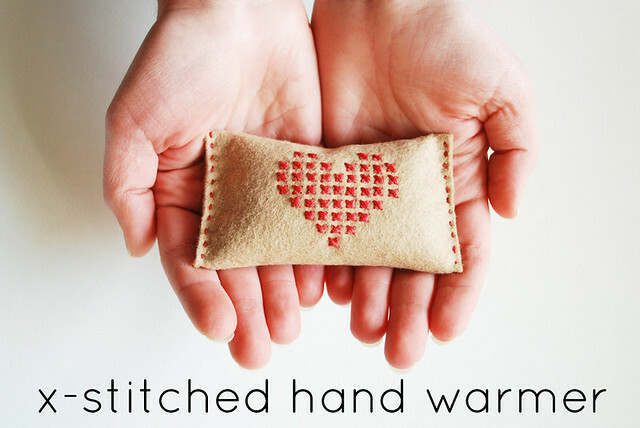 These simple hand warmers are easy to make, and they really do keep your hands toasty warm! 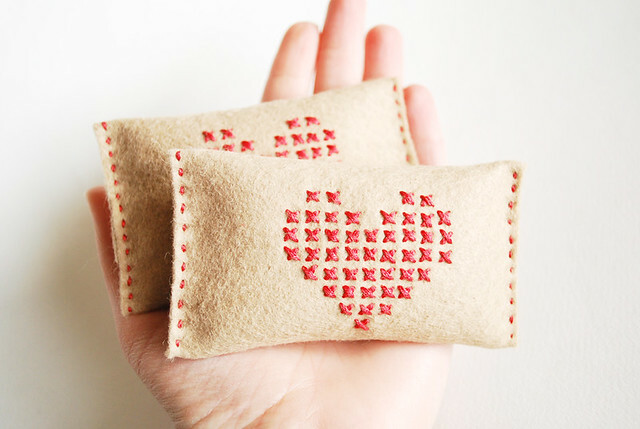 For each hand warmer, cut a piece of felt measuring 4 x 5.75 inches. Embroider a design in the middle. 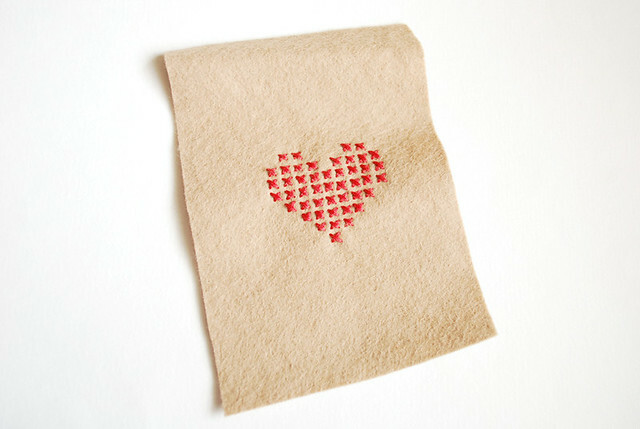 I chose a cross-stitched heart because it felt reminiscent of something one of the Ingalls girls might have stitched (I found a pattern with a quick Google search), but any small-ish design will do. Sew the other end closed. This is so cute! :) Thanks for the tutorial. I loved how in the book Ma put baked potatoes into the cousins pockets for the sleigh ride home. Fingers kept warm and something to eat when you got there! You still come up with the greatest ideas! I had no idea! You're amazing and I love this! These are very cute. I've made a less cute version of these because we live in the chilly UK, but yours look much, much sweeter! We love the "Little House" series. I skipped them in favor of Nancy Drew as a child but read nearly all the the Little House books with my daughter last year - we couldn't put them down! Great post! Will definitely be trying this! This is so fun! 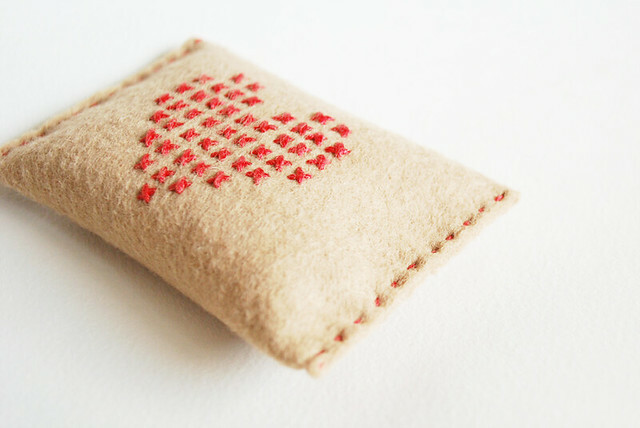 I will definitely be making some of these for my pockets. I have recently broke out my Little House books again and have been re-reading them...I feel like they had such wonderful ideas and traditions! I am learning things I never would have caught when I was a kid. I'd love to try this, but I don't own a microwave. 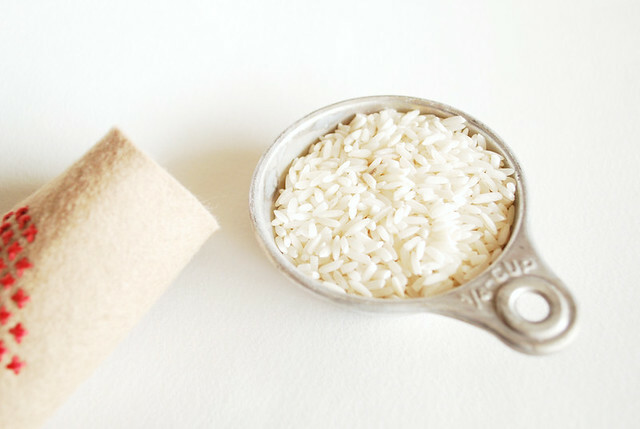 What would be a good way to warm the rice up without? In my opinion perhaps it can be heated in a saucepan. Like popcorn.. But I don't know. Maybe it may burn..
what about warming in the oven for a bit. With any of these methods, use caution and keep an eye on them as they heat. i adore these! need to make for my cold walks from my car to work! How adorable! Could you maybe share the link where you found the pattern for the heart design??? These are great except you probably don't have a microwave while camping! True! I use mine on cold car rides while the heat is still warming up! Oh! And one last question (sorry, but I really want to make these properly! :-P). 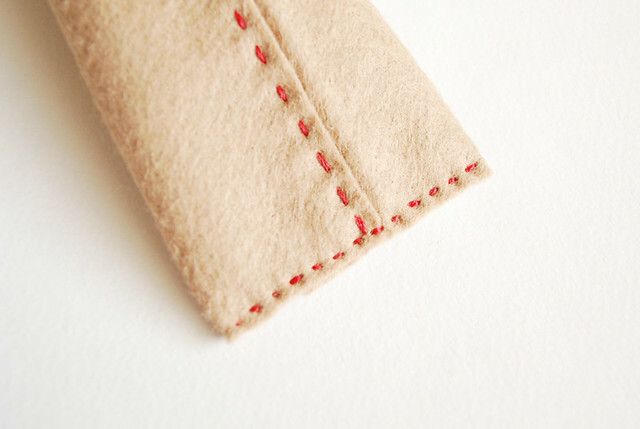 Do you need to use wool felt? I have some felt scraps at home, but I don't think they are made of wool... ??? I couldn't say for sure, but I'd be hesitant to microwave acrylic felt...I'd hate to have it melt or burn! Plus the wool holds up much nicer. 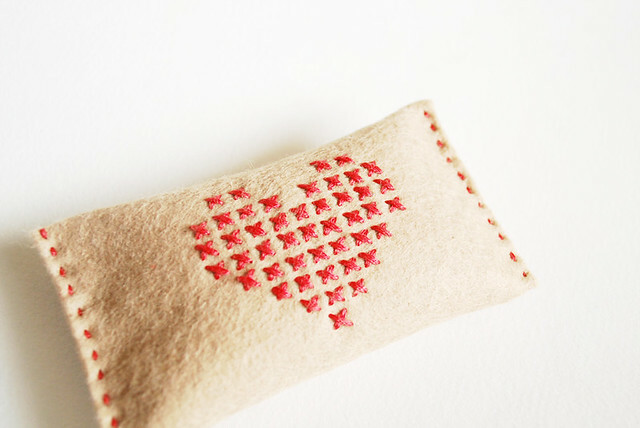 But you could try this with other natural fiber fabrics, like corduroy or cotton. It's beautiful. I loved it. You are so clever. This is the most fabulous idea. Will make great presents too. Such a cute idea and very useful too! I love Little House on the Prairie books , read them all as a child and really should reread them as they are my all time favorite books. I did give my granddaughter one of the books for Christmas . Thanks for the pattern. I made a set of these tonight. I love them. Thank you for the tutorial. This is such a cute idea! 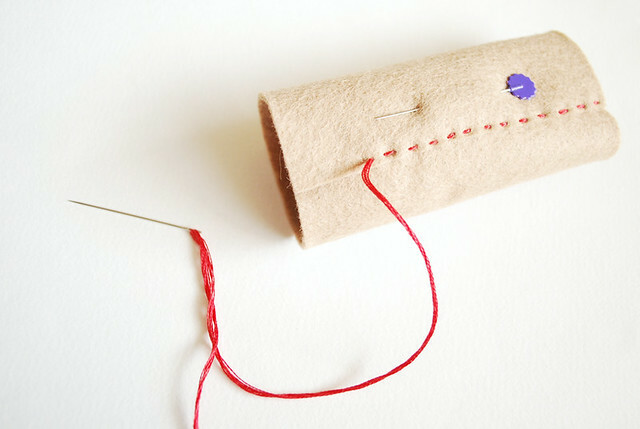 Just an FYI for cross stitching - there is a throw away fabric just for this, instead of using tissue paper. You attach it to whatever fabric you're stitching on that is not the usual cross stitch fabric, stitch your design over it and then remove the fabric first horizontally and then vertically (kind of like un-weaving a basket) and voila! You have your beautiful cross stitch design. I can't remember the name of the brand, probably more than one, but they have it at both Michael's and Joann's in the cross stitch section. It's blue and white. I got to using tracing paper with my embroidery because it's pretty easy to use, and I have plenty left over from my art classes in college. Cross-stitches were just a different animal with it! I've never tried waste cloth, but I keep meaning to. I'll pick some up next time I'm at JoAnn's! Thank you! I think what you are talking about is waste canvas. Thanks so much for the inspiration! I linked to this tutorial! thanks again! Wow… this is really nice. Thanks for sharing the pics, would definitely make two for each one in family with various cross patterns. 60 years reign and still doing well. Thumbs up. The little hearts and the rice fill up is such a superb idea. Microwave these little things and your hands will be warm and cozy for hours. Probably not, but I feel safer recommending natural fibers for this. Only because I'm not sure if acrylic or eco felt would melt in the microwave. This would be great for kids walking to school!